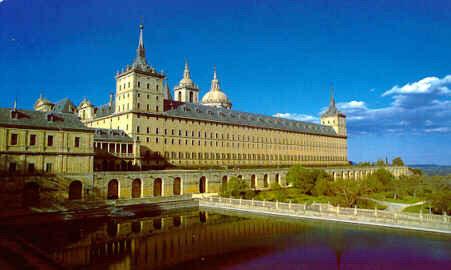 El Escorial, or by its full name Monasterio de San Lorenzo del Escorial, is one of the most impressive buildings in Spain. 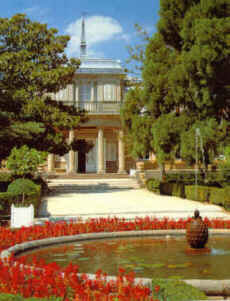 It was built by Felipe II, to celebrate his victory over the French in 1557. In the Pantheon de los Reyes you will find the bodies of almost every King of Spain. 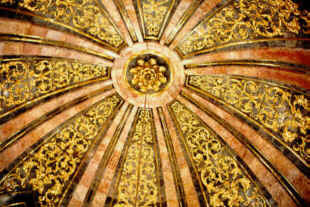 This is a picture of the gold-plated roof of the Pantheon. 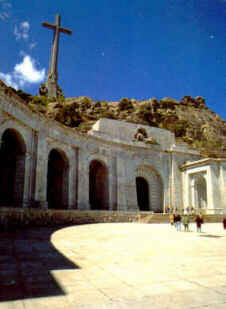 Near El Escorial is the Valle de los Caidos, a 'monument' for those who fell in battle in the Civil War of Spain. Those who fell on the winning side, that is. Franco used the losers of the Spanish war to build this construction. A lot of prisoners died here, which is the reason the 'monument' is a horror to a lot of Spanish people today. The 150 meter high cross can be seen from far away.